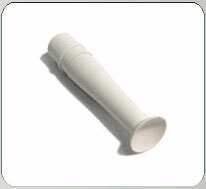 DMV® lens removers are used worldwide for insertion and removal of all types of contact lenses. The DMV “Ultra” is intended for use on hard and gas permeable contact lenses. Only use under the supervision or recommendation of your eyecare professional. Indications: For insertion and removal of hard and gas permeable contact lenses. 2. The lens will adhere in this position while being placed on the eye. 3. Touch the moistened lens to the eye and it will quickly transfer to the eye from the insertion cup. 1. Moisten the suction cup of the DMV® Ultra and guide it to the eye. 2. Be sure the contact lens is centered on the eye before removing it. 4. When the suction cup touches the lens, gentle pressure will make the lens adhere to the cup. 5. Take the contact lens from the eye. It is safe and easy. 6. After removal from the eye, carefully slide the lens sideways from the suction cup and it will come off easily. Keep your DMV® Ultra clean by washing it frequently in warm soapy water. You may boil or autoclave the DMV® Ultra if you wish. Safety Packaging - Use only if device is clean and in its case. Warning: In the event that the suction cup would be unintentionally attached to the eye, merely slide it to the outside corner and it can be easily removed by turning. If this occurs and you experience eye pain, changes in vision, redness or irritation of the eye, or if the condition worsens or persists, consult a physician. Use of this contact lens accessory product is not recommended with diseased or injured eyes. Keep this and all other medical devices away from small children.